Li makes history for China at Royal Birkdale to finish third in the Open Championship. 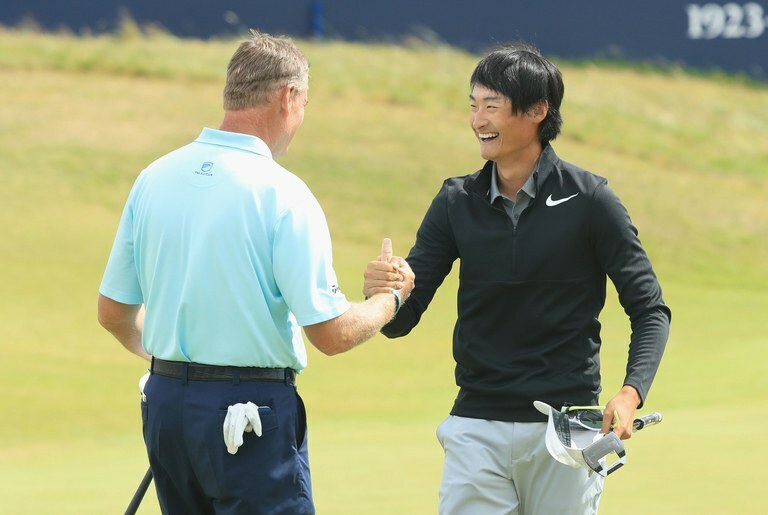 Chinese prodigy Li Haotong registered his country’s best-ever performance in a major after shooting a 63 in his final round at Royal Birkdale on Sunday to finish third in the Open Championship. Li, 21, started the day at +1 for the championship and parred his first seven holes before a remarkable run of seven birdies and four pars in his remaining 11 holes. His seven-under-par round allowed him to end the championship at six under par, behind only the winner Jordan Spieth, on 12-under, and runner-up Matt Kuchar. It was just the 32nd round of 63 ever recorded in a major championship and just the 11th achieved at an Open. The score was the all-time low in a major until Saturday, when South Africa’s Branden Grace broke new ground with an unprecedented 62 in the third round. “For some reason after hole No 8 I just started holing everything. Now I’m feeling awesome, it is unbelievable actually. It means a lot to me,” Li said. Playing with South Africa’s Ernie Els, a two-time former British Open winner, Li sealed his superb effort with an immaculate approach shot to within five feet of the pin on 18, leaving an easy birdie putt. He made birdie at each of his last four holes. Earlier in the day he had been listed as a 1000/1 shot by some bookmakers to win the championship. His performance means he qualifies for next year’s Masters at Augusta. “He was playing good and making putts. And he had a nice attitude. And I could see he wasn’t backing off,” said his playing partner Els, who shot 74 to end on +5. Li had gone 69-73-69 through his first three rounds, solid if unspectacular form. But he made history at the US Open last month at Erin Hills when he became the first player from mainland China to make the cut of a major. He ended up shooting 82 and 84 over the weekend to finish last among the players to make the cut, but he also won the China Open last year when still just 20 and represented his country at the Olympics in Rio. Royal Birkdale has seen great performances from Asian golfers before at the British Open. In 1971, Taiwan’s Lu Liang-Huan, sporting a pork pie hat wherever he went, finished second to Lee Trevino of the United States, missing out on the Claret Jug by a single stroke.